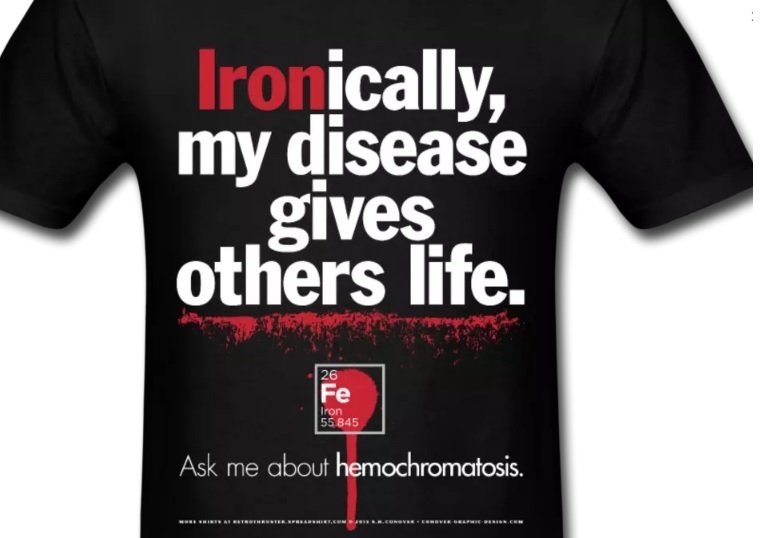 Hereditary haemochromatosis (HH) is a common, treatable and preventable inherited disorder in which excessive iron is absorbed from the intestine. Iron overloading left untreated can lead to organ damage over time. Iron overload in vital organs increases the risk of disease such as liver cirrhosis, arthritis, fatigue, and diabetes. The full expression of iron overload-related disease in people with a genetic vulnerability depends on age and gender, plus the complex interplay of environmental factors and modifier genes. Symptoms: Iron overload can give rise to a wide range of non-specific symptoms and clinical findings. Sometimes, even experienced doctors discussing the more serious symptom won’t make the connection between that issue and several other symptoms that could lead to a diagnosis of haemochromatosis and its quite straightforward treatment. Since gene testing has been available, earlier diagnosis is being made. Today, fewer patients have symptoms and more and more patients are diagnosed without symptoms and before complications have developed (see table 3 comparing symptoms pre-gene testing 1980 and just after gene testing in 1997). The HFE gene: The HFE (high Fe iron) protein is essential for regulating iron transport into cells. Mutations of the HFE gene result in loss of this regulation causing accumulation of iron within cells. This was first discovered as the causative gene for haemochromatosis in 1996 and today genetic testing is available. HFE-haemochromatosis is the most common autosomal recessive disorder in Northern European populations with heterozygous carrier rates of about 20% for H63D and 10% for C282Y. 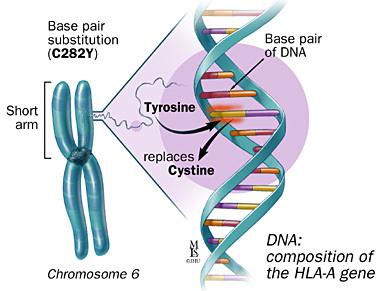 Two common inherited gene mutations in the HFE gene are responsible for the majority of clinical cases of iron overload: over 90% of case of HH in Australia are due to C282Y homozygosity (or now called p.Cys282Tyr) and 5% are due to C282Y/H63D compound heterozygosity (now called p.Cys282Tyr/p.His63Asp). In populations of people of northern European descent, about 2% (1.7-4.1%) have the C282Y/H63D and 0.5% have the C282Y/C282Y. Advantages of HFE gene mutations in asymptomatic individuals: The observation that HFE mutations are common, but rarely cause major disease, has led to the hypothesis that over centuries, these mutations may have spread throughout the Caucasian population because they actively promoted the health of its carriers. Recent studies have provided evidence that HFE mutation carriers might benefit from the mutation-associated increased iron levels as long as the iron overload is mild. C282Y, H63D and S65C variants can positively influence the immune system, the general fitness and reproductive status of mutation carriers, and might even diminish the risk of developing diseases such as amyotrophic lateral sclerosis (ALS), Alzheimer’s disease (AD), Parkinson’s disease, and atherosclerosis. Future clinical and biochemical studies may reveal more detailed information about the impact of HFE mutations on the health of their carriers and may provide an answer to the long-standing question as to why HFE mutations have so far been inherited with such a high frequency. Risk of disease: After the discovery of the HFE gene in 1996, haemochromatosis has gradlally and subtly changed its face. It was initially believed that every individual with a mutation in each copy of the gene would develop HH. However, it is now known not to be the case. Although most cases of HH in Australia are due to these two common HFE gene mutations, a positive HFE genetic test only confirms a vulnerability for HH. Other genetic and environment factors contribute to the risk of disease. Without treatment, C282Y homozygotes have a 60-80% life time risk of abnormal iron indices but, a minority - 28-45% of males and 1-9% of females - will progress through all stages of disease development. Individuals with C282Y homozygosity with ferritin <1000 left untreated can have excellent prognosis particularly if they don't have cirrhosis, diabetes or drink excess alcohol and with treatment. While controversial, one French group found recently that these treated C282Y homozygotes had better life expectancy than the background population at large. Most C282Y/H63D compound heterozygotes with iron overload have a milder form of disease. One large study showed compound heterozygous individuals have a 1.3% chance of having iron overload and none had cirrhosis. They are diagnosed 8-10 years later and usually have other factors such as obesity or heavy drinking (namely a body mass index (BMI) greater than 30 kg/m2 or alcohol intake >60 g/day for men and >40 g/day for women). Thus the H63D variant, prevalent in 14-20% Caucasians, is a susceptibility factor - a genetic variant that has no impact on disease in isolation - decreasing the liver's and perhaps other organ's resilience to a lifetime of harmful environmental factors and toxins. Clinical disease is much less common in females due to increased iron requirements and blood loss from pregnancy and menstruation. Iron overload in women is often delayed to the postmenopausal years. Genetic counseling: This should be offered to the newly diagnosed patient and his/her family. First-degree family members over 20 years old should be evaluated with measurement of their serum iron parameters (transferrin saturation, ferritin) and testing their HFE profile. This is initiated by the patient who is the sole person legally allowed to inform the family members. Diagnosis: We clearly need to distinguish between haemochromatosis ‘patients’ who suffer from the pathophysiological complications associated with iron overload and individuals who carry HH-associated mutations without showing any disease symptoms who may have genetic or environmental advantages. HH is diagnosed in stage 2 and beyond (see below). Fasting abnormal iron indices including increased transferrin saturation (TS>45%) and serum ferritin (SF> 300 μg/L in men; > 200 μg/L in women) generally indicates systemic iron overload, and, in the context of C282Y homozygosity, indicates that the individual is at risk of iron-overload progression (stage 2). There are two caveats. The within-person variability (biological and analytical) of transferrin saturation, limit its usefulness as an initial screening test for expressing HFE genotypes. Also, while there is a diurnal variation in iron, the importance of collecting iron studies in the fasting state is debated. Increased TS may be seen in chronic anaemia and advanced liver disease. In HH, increased TS reflects increased iron absorption and increased SF reflects iron excess : mild < 500 μg/L, medium to 500–1000, and severe > 1000. Before starting venesections, particularly for compound heterozygotes under 40 years of age, it is important to take into account other causes of high SF such as alcohol, dysmetabolic syndrome, liver necrosis, malignancy, inflammation or infection and to make lifestyle and dietary changes where obesity and alcohol excess exists. Stage 0 = C282Y homozygosity without biochemical (normal TS and SF) or clinical symptoms. Stage 1 = C282Y homozygosity with increased TS > 45% but normal SF and no clinical symptoms. Stage 2 = C282Y homozygosity with both increased TS and SF but no clinical symptoms. Stage 3* = C282Y homozygosity with increased TS and SF, and clinical symptoms affecting the quality of life (asthenia, impotence, arthropathies: presence of bony spur, tenderness or effusion of the 2nd and 3rd MCP joints on either hand). Stage 4* = C282Y homozygosity with increased transferrin saturation, increased ferritin, and clinical symptoms manifesting organ damage predisposing to early mortality (cirrhosis with the risk of hepatocellular carcinoma, insulin-dependent diabetes, cardiomyopathy). 2. Liver biopsy showing a hepatic iron index ≥1.9 (calculated as micromoles of iron per gram dry weight of liver divided by age in years). Liver biopsy may also be helpful, to show where the iron is (hepatocyte versus macrophage) and if other conditions are present (fatty liver, steato-hepatitis, alcoholic hepatitis). Dysmetabolic hyperferritinemia (also dysmetabolic hepatosiderosis or insulin resistance–associated iron overload) is commonly misdiagnosed as HH. It typically presents with: i) multiple metabolic abnormalities, including increased body mass index, central obesity (Europid man 94cm, women 80cm), high blood pressure, athrogenic hyperlipidemia, noninsulin-dependent diabetes, and hyperuricemia (with sometimes overt clinical gout); ii) increased SF (may exceed 1000 μg/L); iii) normal TS < 45% (may be increased if there is steatohepatitis); iv) mild hepatic iron excess (especially relative to SF levels), usually < 3 x ULN of hepatic iron concentration (on MRI or liver biopsy); v) mixed (i.e., both hepatocyte and macrophage) iron deposition on liver biopsy. It may co-exist with HH. The iron balancing act: Iron's unique ability to carry oxygen and to transfer electrons in oxidation-reduction reactions make this element essential for life. The body normally stores about 4g (2-6g) of iron: found in circulating blood (2.5g), the reticuloendothelial system (1g total with 0.5g in liver), muscle myoglobulin (300mg) and within every cell's mitochondria. The average HH patient accumulates 0.5-1g per year so that by 40 years old in men and by 60 years in women symptoms develop when total body iron ranges 15-40g and can exceed 50g. In uncomplicated iron deficiency and HH 1ng/mL of ferritin suggests 8-10mg iron. However, confidence intervals are wide depending on the study. Just as there have been patients with ferritins as low as 1-26, who still have bone marrow haemosiderin (ie. normal iron stores), there have been other patients iron deficient with ferritin 3765 ug/L. Namely ferritin needs expert interpretation as a HH patient with ferritin 1500ng /mL could have a low liver iron concentration (LIC) found on liver biopsy of 3mmol/g if there is necroinflammatory liver disease or a very high liver iron of 30mmol/ g with iron overload. 1-2 mg of iron is absorbed each day (about 10% of the normal 10 to 20 mg of dietary iron), and this is sufficient to balance the 1 to 2 mg daily iron losses. While the average absorption of dietary iron is 10%, the range is 5-35% and depends on a number of factors. The two major sources - organic (heme) iron and inorganic (non-heme) iron - are absorbed with different efficiency. Organic (heme) iron derived from animal protein like meat is absorbed 4 times more efficiently (at about 15-35%) compared to inorganic (non-heme) iron found in enriched cereals, pasta, beans and dark green leafy vegetables (at about 5-20%). The duodenal uptake of heme iron by enterocytes is not affected much by consumption of other foods. However, absorption of nonheme iron requires solubilising and hydrolysing and is relatively inefficient. It can be altered substantially by co-consumption of certain dietary elements. Factors that enhance non heme iron absorption include animal protein, fructose, copper, ascorbic acid (vitamin C), citric acid and normal stomach hydrochloric acid. Factors that decrease nonheme iron absorption include vegetable protein, phytic or oxalic acid, zinc, calcium, eggs, tea and coffee and strong antacids like proton pump inhibitors. So iron input minus iron output is balanced at zero with 1-2mg iron losses from GI/skin epithelial cells or menses and 10% absorption of 10-20mg per day dietary iron namely 1-2mg (1g males, 1.5g females). There is some variation depending on dietary factors and three times increased absorption occurs if there is iron deficient or HH (5-10mg retained/day). For example if there is 3mg extra iron absorbed per day with HH, this can amount to 1g per year and by 30 years thats over 30g of excess iron. To get that down to normal 4g of stored iron is going to require some 26g of iron removed. This is done via venesection (also call phlebotomy). 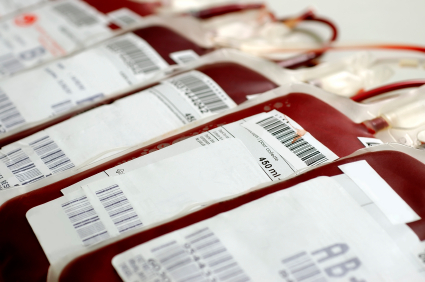 As a pint of blood contains about 250mg of iron, that's over 100 pints of blood needed to get to 26g. If you remove one pint a week, you can see it can take 2 years to back to normal safe iron stores of 2-6g. 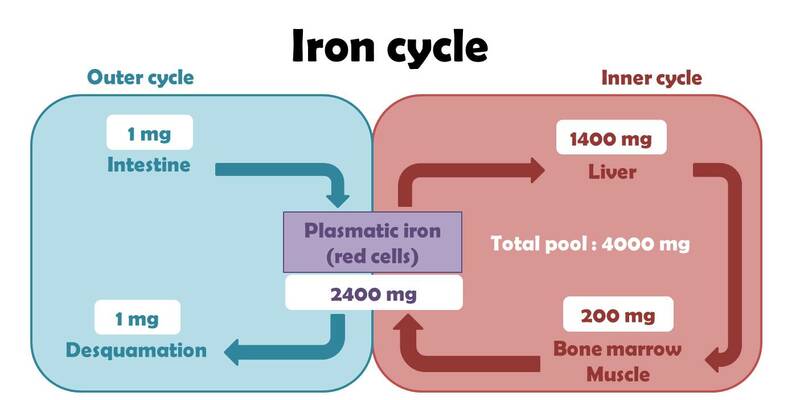 "Phlebotomise 500 mL once a week if Hb =or >12g/dL, iron studies every 4 weeks"
Indication: Venesection therapy should be started at stage 2 of the phenotypic classification of HFE hemochromatosis, corresponding to increased plasma ferritin levels >200-500. Withdrawal schedule. The venesections are usually performed on a weekly basis (or twice weekly for SF >750). Frequency can be adapted to both initial SF and the patient’s tolerance. Volume is adapted to body weight: 7 mL/kg body weight, not exceeding 550 mL per phlebotomy. Generally when the ferritin < 500ng/mL, the frequency of phlebotomy can be slowed to once a month. Goal. The goal is to obtain ferritinemia ≤ 50 μg/ on at least one occasion. Thereafter, the ferritin can be maintained within the range of 25-75 ng/mL or <100 ng/mL. Follow-up. Efficiency is based on serum ferritin, checked every 4-6 weeks as long as ferritin levels and transferrin saturation remain above the upper normal limits (300 μg/L in men, 200 μg/L in women, t/saturation 45%). Thereafter, testing should be performed every two venesections. Tolerance is based clinically on general assessment (with blood pressure surveillance) at each withdrawal. Venesections should be postponed whenever hemoglobin values are < 12 g/dL. How quick? Ferritin drops steadily by about 30-50ng/mL with each full unit of blood removed (ie. 250mg iron in 450mL blood). If SF falls more rapidly, inflammation or infection may be contributing to high SF and patient may be at risk of over-bleeding. In the past, it was not uncommon to need 80 to 100 phlebotomies to achieve normal iron stores in symptomatic patients. With earlier diagnosis, 30 phlebotomies or less may be enough. In a recent series, removal of a mean of 30 units of blood (approximately 7.5 g of iron) was required to normalize body iron stores. Management is based on ferritin values, which reflect the amount of stored iron. It is not necessary to normalise TS. Transferrin saturation levels can fluctuate and be acceptable as long as values remain < 75% - when the TS is below this threshold, no potentially toxic iron species are expected to be present in the circulation. This addresses the common misconception that transferrin saturation reflects the degree of saturation of the overall body in iron. Serum ferritin levels should be checked at least every 10 venesections and then at least every two venesections as SF approaches 100µg/L, as it is important to avoid overbleeding and iron deficiency. Haemoglobin is monitored within the 8 days preceding each phlebotomy (checking these parameter immediately prior to the venesection is often the simplest procedure). Venesection should only go ahead if the haematocrit is within 20% of the previous measurement and/or haemoglobin >12g/dL. Venesections can be performed at the blood bank, in the hospital, in a day surgery, by the general practitioner, or at home by a nurse provided a good network and written guidelines have been set up between the various medical and non-medical partners.